For the first time in more than a decade, diesel demand has declined this fiscal as monthly price hikes and increased power generation clipped consumption, Indian Oil Corporation (IOC) Chairman R S Butola said. Diesel, which is India's most consumed fuel accounting for close to 45 per cent of the total petroleum product demand, has seen sales growth of 6-8 per cent since 2003-04. But this year, it has fallen by 0.8 per cent over last year to 39.46 million tons. "This year there has been 0.8-1 per cent degrowth," he said at the 3rd World Energy Summit. The deceleration in diesel demand, he said, was due to better power production which saw lesser burning of the fuel in gensets. But the bigger reasons is the move to deregulate diesel rates through small monthly increases. "Small adjustments of 50 paise every month has brought some parity with cost," he said. Diesel rates have risen by a cumulative Rs 6.62 per since January, leading to drop in demand. Butola said petrol consumption had dropped when the fuel was deregulated in June 2010 but diesel continued to see rise in consumption as it was heavily subsidised thereby discouraging people to use it optimally. Now, petrol is at par with its cost of production but the current selling price of diesel still is a Rs 9.99 a litre lower than its cost. "We believe that market forces need to be allowed to have proper inter-play (on demand and consumption)," he said. While diesel sales dropped in first seven months of the fiscal year that began in April, petrol consumption has risen by 10 per cent to 9.05 million tons. Overall, fuel demand during April-October was largely unchanged at 90.576 million tons when compared with 90.233 million tons of consumption in the same period last year. Besides losing Rs 9.99 a litre on diesel, fuel retailers are currently losing Rs 36.20 per litre on kerosene sold through the public distribution system and Rs 542.50 per 14.2-kg cylinder of domestic cooking gas (LPG), according to IOC, the nation's largest oil refining and marketing company. 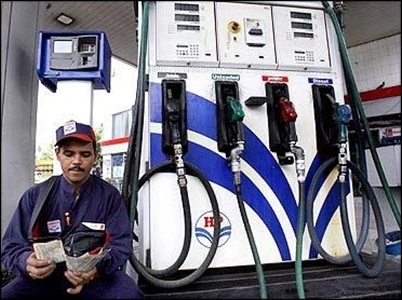 Last fiscal, diesel sales had risen 6.68 per cent to 69.08 million tons. Diesel consumption in 2003-04 was 37.07 million tons and has risen to 69.08 million tons in 2012-13. It had recorded a 11.1 per cent growth in 2007-08. Jaipur: BJP unconvinced of exit poll, Cong hoping for hung Assembly?